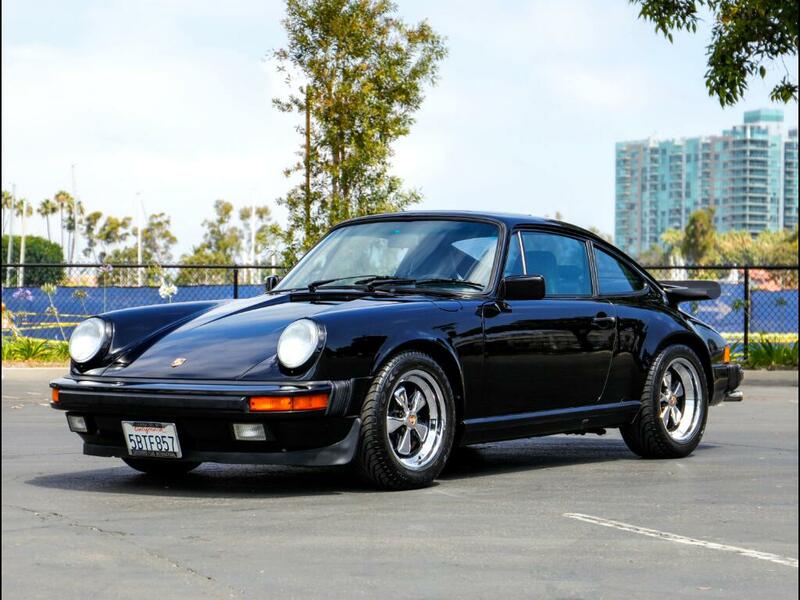 Chequered Flag International is pleased to offer this 1987 Porsche 911 G50 Coupe in Black with Black interior. 71,400 miles with clean Carfax. Southern California car from new. Sold new by McKenna Porsche in Norwalk. Fantastic body with excellent paint. Superb interior, soft seats, uncracked dash. Later stereo unit fitted. Drivers door panel has four small holes where a cup holder was previously installed. Mechanically superb and a delight to drive. Just checked and serviced with new front & rear pads and front rotors, replaced brake & clutch fluid, new alternator, new belts, A/C service with conversion to R134A, 4 wheel alignment and new battery, . Previously very well serviced too with lots of records - $7,000 spent on last two services within the last 1500 miles. Appears to have had four local So Cal owners. Service records. Maintenance book (with option code sticker) is stamped till '96 - 30k miles. Records from '95 to '00 and the last owner's records form Aurel & Dons in North Hollywood form '01 to 2016 ('14 & '16 total $6,925). Comes with books. tools, jack and records. You just cant beat a G50 Coupe. Black/Black is the color, 7's and 8's are a great option. 71k is still low miles, but not so low you wont drive it - this is the one to own! Inspections encouraged. All sales AS-IS. Sales tax and license fees due if delivered in California.